Clean Code concepts adapted for TypeScript. Software engineering principles, from Robert C. Martin’s book Clean Code, adapted for TypeScript. This is not a style guide. It’s a guide to producing readable, reusable, and refactorable software in TypeScript. Our craft of software engineering is just a bit over 50 years old, and we are still learning a lot. When software architecture is as old as architecture itself, maybe then we will have harder rules to follow. For now, let these guidelines serve as a touchstone by which to assess the quality of the TypeScript code that you and your team produce. One more thing: knowing these won’t immediately make you a better software developer, and working with them for many years doesn’t mean you won’t make mistakes. Every piece of code starts as a first draft, like wet clay getting shaped into its final form. Finally, we chisel away the imperfections when we review it with our peers. Don’t beat yourself up for first drafts that need improvement. Beat up the code instead! Distinguish names in such a way that the reader knows what the differences offer. If you can’t pronounce it, you can’t discuss it without sounding like an idiot. We will read more code than we will ever write. It’s important that the code we do write is readable and searchable. By not naming variables that end up being meaningful for understanding our program, we hurt our readers. Make your names searchable. Tools like TSLint can help identify unnamed constants. // What the heck is 86400000 for? // Declare them as capitalized named constants. If your class/type/object name tells you something, don’t repeat that in your variable name. Default arguments are often cleaner than short circuiting. One or two arguments is the ideal case, and three should be avoided if possible. Anything more than that should be consolidated. Usually, if you have more than two arguments then your function is trying to do too much. In cases where it’s not, most of the time a higher-level object will suffice as an argument. Consider using object literals if you are finding yourself needing a lot of arguments. When someone looks at the function signature, it’s immediately clear what properties are being used. Destructuring also clones the specified primitive values of the argument object passed into the function. This can help prevent side effects. Note: objects and arrays that are destructured from the argument object are NOT cloned. TypeScript warns you about unused properties, which would be impossible without destructuring. This is by far the most important rule in software engineering. When functions do more than one thing, they are harder to compose, test, and reason about. When you can isolate a function to just one action, they can be refactored easily and your code will read much cleaner. If you take nothing else away from this guide other than this, you’ll be ahead of many developers. Do your absolute best to avoid duplicate code. Duplicate code is bad because it means that there’s more than one place to alter something if you need to change some logic. Imagine if you run a restaurant and you keep track of your inventory: all your tomatoes, onions, garlic, spices, etc. If you have multiple lists that you keep this on, then all have to be updated when you serve a dish with tomatoes in them. If you only have one list, there’s only one place to update! Oftentimes you have duplicate code because you have two or more slightly different things, that share a lot in common, but their differences force you to have two or more separate functions that do much of the same things. Removing duplicate code means creating an abstraction that can handle this set of different things with just one function/module/class. Getting the abstraction right is critical, that’s why you should follow the SOLID principles. Bad abstractions can be worse than duplicate code, so be careful! Having said this, if you can make a good abstraction, do it! Don’t repeat yourself, otherwise you’ll find yourself updating multiple places anytime you want to change one thing. You should be critical about code duplication. Sometimes there is a tradeoff between duplicated code and increased complexity by introducing unnecessary abstraction. When two implementations from two different modules look similar but live in different domains, duplication might be acceptable and preferred over extracting the common code. The extracted common code in this case introduces an indirect dependency between the two modules. To avoid any side effects and unexpected behavior by passing in explicitly the undefined or null value, you can tell the TypeScript compiler to not allow it. See --strictNullChecks option in TypeScript. Now, you do need to have side effects in a program on occasion. Like the previous example, you might need to write to a file. What you want to do is to centralize where you are doing this. Don’t have several functions and classes that write to a particular file. Have one service that does it. One and only one. The user clicks the “Purchase”, button which calls a purchase function that spawns a network request and sends the cart array to the server. Because of a bad network connection, the purchase function has to keep retrying the request. Now, what if in the meantime the user accidentally clicks “Add to Cart” button on an item they don’t actually want before the network request begins? If that happens and the network request begins, then that purchase function will send the accidentally added item because it has a reference to a shopping cart array that the addItemToCart function modified by adding an unwanted item. A great solution would be for the addItemToCart to always clone the cart, edit it, and return the clone. This ensures that no other functions that are holding onto a reference of the shopping cart will be affected by any changes. Cloning big objects can be very expensive in terms of performance. Luckily, this isn’t a big issue in practice because there are great libraries that allow this kind of programming approach to be fast and not as memory intensive as it would be for you to manually clone objects and arrays. Favor this style of programming when you can. This seems like an impossible task. Upon first hearing this, most people say, “how am I supposed to do anything without an if statement?” The answer is that you can use polymorphism to achieve the same task in many cases. The second question is usually, “well that’s great but why would I want to do that?” The answer is a previous clean code concept we learned: a function should only do one thing. When you have classes and functions that have if statements, you are telling your user that your function does more than one thing. Remember, just do one thing. Modern browsers do a lot of optimization under-the-hood at runtime. A lot of times, if you are optimizing then you are just wasting your time. There are good resources for seeing where optimization is lacking. Target those in the meantime, until they are fixed if they can be. // because of `list.length` recomputation. In modern browsers, this is optimized. Dead code is just as bad as duplicate code. There’s no reason to keep it in your codebase. If it’s not being called, get rid of it! It will still be safe in your version history if you still need it. Use generators and iterables when working with collections of data used like a stream. // Print first 10 Fibonacci numbers. // Generates an infinite stream of Fibonacci numbers. // The generator doesn't keep the array of all numbers. There are libraries that allow working with iterables in a similar way as with native arrays, by chaining methods like map, slice, forEach etc. See itiriri for an example of advanced manipulation with iterables (or itiriri-async for manipulation of async iterables). When you want to do more beyond getting an object property, you don’t have to look up and change every accessor in your codebase. You can lazy load your object’s properties, let’s say getting it from a server. // Now `BankAccount` encapsulates the validation logic. // leaving all dependent code unchanged. TypeScript supports public (default), protected and private accessors on class members. TypeScript’s type system allows you to mark individual properties on an interface / class as readonly. This allows you to work in a functional way (unexpected mutation is bad). For more advanced scenarios there is a built-in type Readonly that takes a type T and marks all of its properties as readonly using mapped types (see mapped types). Use type when you might need a union or intersection. Use interface when you want extends or implements. There is no strict rule however, use the one that works for you. For a more detailed explanation refer to this answer about the differences between type and interface in TypeScript. The class’ size is measured by its responsibility. Following the Single Responsibility principle a class should be small. Cohesion defines the degree to which class members are related to each other. Ideally, all fields within a class should be used by each method. We then say that the class is maximally cohesive. In practice, this however is not always possible, nor even advisable. You should however prefer cohesion to be high. Coupling refers to how related or dependent are two classes toward each other. Classes are said to be low coupled if changes in one of them doesn’t affect the other one. Good software design has high cohesion and low coupling. // Bad: each private variable is used by one or another group of methods. // It makes clear evidence that the class is holding more than a single responsibility. // I'm still forced to pass and instance of `emailSender`. Your inheritance represents an “is-a” relationship and not a “has-a” relationship (Human->Animal vs. User->UserDetails). This pattern is very useful and commonly used in many libraries. It allows your code to be expressive, and less verbose. For that reason, use method chaining and take a look at how clean your code will be. As stated in Clean Code, “There should never be more than one reason for a class to change”. It’s tempting to jam-pack a class with a lot of functionality, like when you can only take one suitcase on your flight. The issue with this is that your class won’t be conceptually cohesive and it will give it many reasons to change. Minimizing the amount of times you need to change a class is important. It’s important because if too much functionality is in one class and you modify a piece of it, it can be difficult to understand how that will affect other dependent modules in your codebase. As stated by Bertrand Meyer, “software entities (classes, modules, functions, etc.) should be open for extension, but closed for modification.” What does that mean though? This principle basically states that you should allow users to add new functionalities without changing existing code. This is a scary term for a very simple concept. It’s formally defined as “If S is a subtype of T, then objects of type T may be replaced with objects of type S (i.e., objects of type S may substitute objects of type T) without altering any of the desirable properties of that program (correctness, task performed, etc. ).” That’s an even scarier definition. The best explanation for this is if you have a parent class and a child class, then the parent class and child class can be used interchangeably without getting incorrect results. This might still be confusing, so let’s take a look at the classic Square-Rectangle example. Mathematically, a square is a rectangle, but if you model it using the “is-a” relationship via inheritance, you quickly get into trouble. .getArea(); // BAD: Returns 25 for Square. Should be 20. ISP states that “Clients should not be forced to depend upon interfaces that they do not use.”. This principle is very much related to the Single Responsibility Principle. What it really means is that you should always design your abstractions in a way that the clients that are using the exposed methods do not get the whole pie instead. That also include imposing the clients with the burden of implementing methods that they don’t actually need. This can be hard to understand at first, but if you’ve worked with Angular, you’ve seen an implementation of this principle in the form of Dependency Injection (DI). While they are not identical concepts, DIP keeps high-level modules from knowing the details of its low-level modules and setting them up. It can accomplish this through DI. A huge benefit of this is that it reduces the coupling between modules. Coupling is a very bad development pattern because it makes your code hard to refactor. // BAD: We have created a dependency on a specific request implementation. Testing is more important than shipping. If you have no tests or an inadequate amount, then every time you ship code you won’t be sure that you didn’t break anything. Deciding on what constitutes an adequate amount is up to your team, but having 100% coverage (all statements and branches) is how you achieve very high confidence and developer peace of mind. This means that in addition to having a great testing framework, you also need to use a good coverage tool. There’s no excuse to not write tests. There are plenty of good JS test frameworks with typings support for TypeScript, so find one that your team prefers. When you find one that works for your team, then aim to always write tests for every new feature/module you introduce. If your preferred method is Test Driven Development (TDD), that is great, but the main point is to just make sure you are reaching your coverage goals before launching any feature, or refactoring an existing one. Fast tests should be fast because we want to run them frequently. Independent tests should not depend on each other. They should provide same output whether run independently or all together in any order. Repeatable tests should be repeatable in any environment and there should be no excuse for why they fail. Self-Validating a test should answer with either Passed or Failed. You don’t need to compare log files to answer if a test passed. Timely unit tests should be written before the production code. If you write tests after the production code, you might find writing tests too hard. Tests should also follow the Single Responsibility Principle. Make only one assert per unit test. When a test fail, its name is the first indication of what may have gone wrong. Callbacks aren’t clean, and they cause excessive amounts of nesting (the callback hell). Promise.resolve(value) Convert a value into a resolved promise. Promise.reject(error) Convert an error into a rejected promise. Promise.all(promises) Returns a new promise which is fulfilled with an array of fulfillment values for the passed promises or rejects with the reason of the first promise that rejects. Promise.race(promises) Returns a new promise which is fulfilled/rejected with the result/error of the first settled promise from the array of passed promises. Promise.all is especially useful when there is a need to run tasks in parallel. Promise.race makes it easier to implement things like timeouts for promises. Thrown errors are a good thing! They mean the runtime has successfully identified when something in your program has gone wrong and it’s letting you know by stopping function execution on the current stack, killing the process (in Node), and notifying you in the console with a stack trace. It is advisable to use the throw syntax with an Error type. This is because your error might be caught in higher level code with a catch syntax. It would be very confusing to catch a string message there and would make debugging more painful. For the same reason you should reject promises with Error types. The benefit of using Error types is that it is supported by the syntax try/catch/finally and implicitly all errors have the stack property which is very powerful for debugging. For the detailed explanation of this idea refer to the original post. Doing nothing with a caught error doesn’t give you the ability to ever fix or react to said error. Logging the error to the console (console.log) isn’t much better as often times it can get lost in a sea of things printed to the console. If you wrap any bit of code in a try/catch it means you think an error may occur there and therefore you should have a plan, or create a code path, for when it occurs. For the same reason you shouldn’t ignore caught errors from try/catch. Formatting is subjective. Like many rules herein, there is no hard and fast rule that you must follow. The main point is DO NOT ARGUE over formatting. There are tons of tools to automate this. Use one! It’s a waste of time and money for engineers to argue over formatting. The general rule to follow is keep consistent formatting rules. Refer also to this great TypeScript StyleGuide and Coding Conventions source. Capitalization tells you a lot about your variables, functions, etc. These rules are subjective, so your team can choose whatever they want. The point is, no matter what you all choose, just be consistent. Prefer using PascalCase for class, interface, type and namespace names. Prefer using camelCase for variables, functions and class members. If a function calls another, keep those functions vertically close in the source file. Ideally, keep the caller right above the callee. We tend to read code from top-to-bottom, like a newspaper. Because of this, make your code read that way. Import statements should be alphabetized and grouped. Unused imports should be removed. Groups of imports are delineated by blank lines. This will avoid long relative paths when doing imports. The use of a comments is an indication of failure to express without them. Code should be the only source of truth. Don’t comment bad code—rewrite it. Comments are an apology, not a requirement. Good code mostly documents itself. // Check if subscription is active. Version control exists for a reason. Leave old code in your history. Remember, use version control! 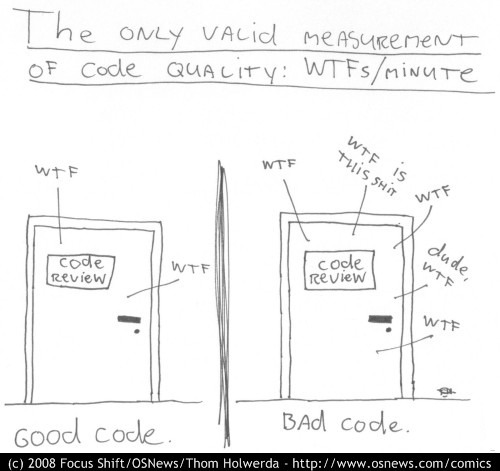 There’s no need for dead code, commented code, and especially journal comments. Use git log to get history! They usually just add noise. Let the functions and variable names along with the proper indentation and formatting give the visual structure to your code. Most IDE support code folding feature that allows you to collapse/expand blocks of code (see Visual Studio Code folding regions). When you find yourself that you need to leave notes in the code for some later improvements, do that using // TODO comments. Most IDE have special support for those kind of comments so that you can quickly go over the entire list of todos. Keep in mind however that a TODO comment is not an excuse for bad code. // ensure `dueDate` is indexed. // TODO: ensure `dueDate` is indexed. References will be added once translations are completed. Check this discussion for more details and progress. You can make an indispensable contribution to Clean Code community by translating this to your language. clean-code-typescript is maintained by labs42io. This page was generated by GitHub Pages.